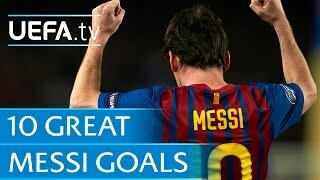 Watch ten great goals from Lionel Messi in the UEFA Champions League. Usually, great Lionel Messi goals involve a burst of speed, brilliant skill and an impudent, implausible finish. Here are 10 of his best in La Liga. Barcelona star Lionel Messi is one of the world's best ever players and he continues to prove it by breaking records and achieving success every season.